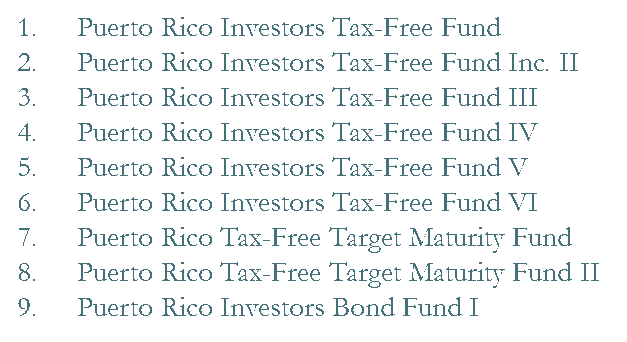 We’ve written extensively about the investment carnage caused by UBS Puerto Rico’s management and sales of closed end municipal bonds funds. 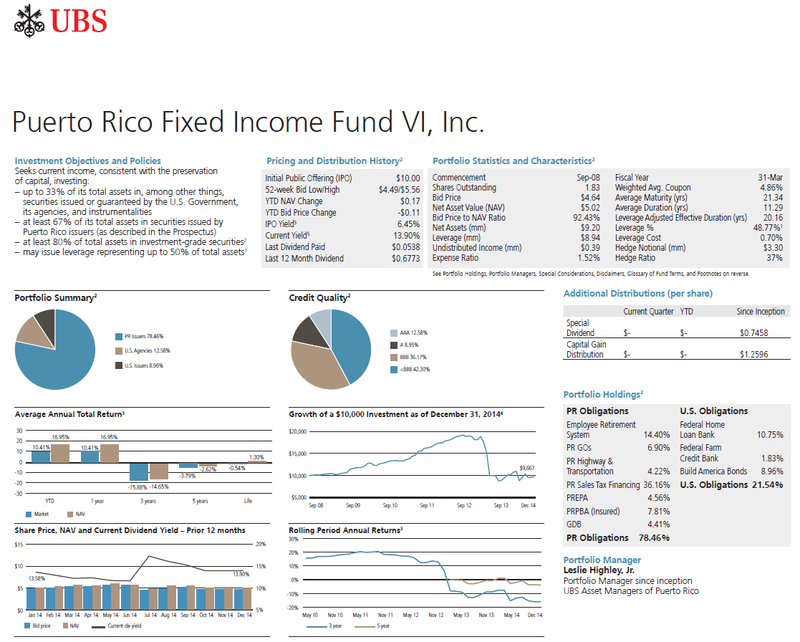 A summary of our findings can be found here: UBS Puerto Rico’s Bond Fund Debacle: What We Know So Far . 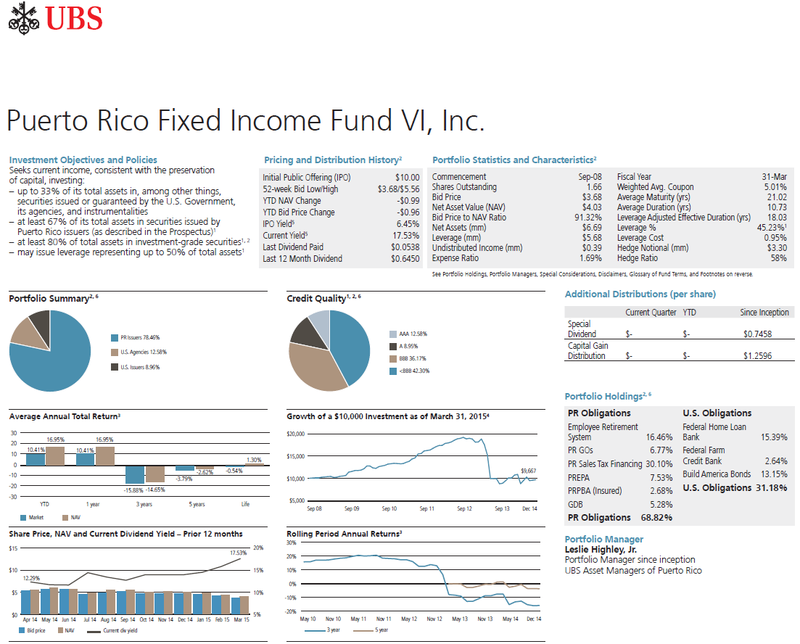 Others will have to decide whether UBS was just incompetent or also wolfishly indifferent to Puerto Rico investors but recent evidence demonstrates that UBS Asset Managers of Puerto Rico continues to be, at least, incompetent. 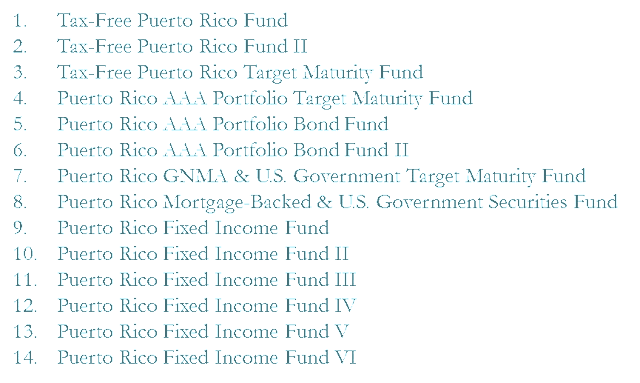 The fourteen closed end funds listed in Figure 1 were solely managed by UBS Asset Managers of Puerto Rico. 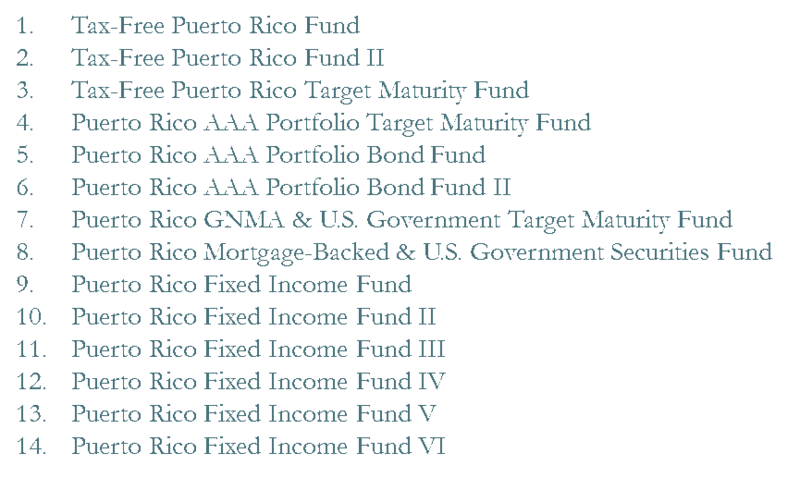 The nine closed end funds listed in Figure 2 were co-managed with Popular Asset Management. Each quarter, UBS prepares and posts to its website a Quarterly Review reporting performance information for each of the 23 funds. The Quarterly Reviews for 4th quarter 2014 are available here , for 1st quarter 2015 here and 2nd quarter 2015 here. 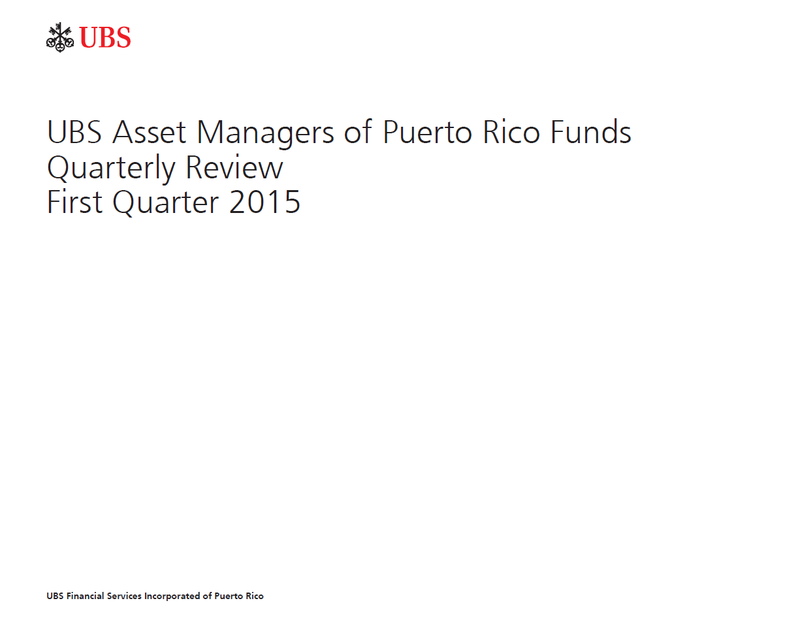 Figure 3 is the cover page for the first quarter of 2015. 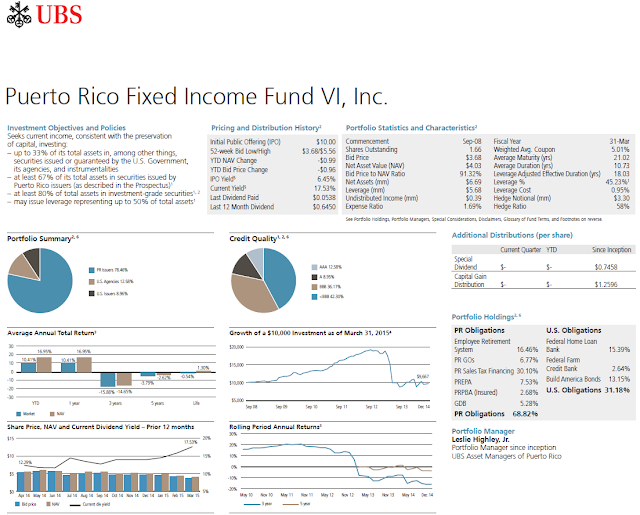 Compare the data in the Quarterly Review for the UBS Puerto Rico Fixed Income Fund VI for the 1st quarter 2015 in Figure 4a with the data in the Quarterly Review for the 4th quarter 2014 in Figure 4b. 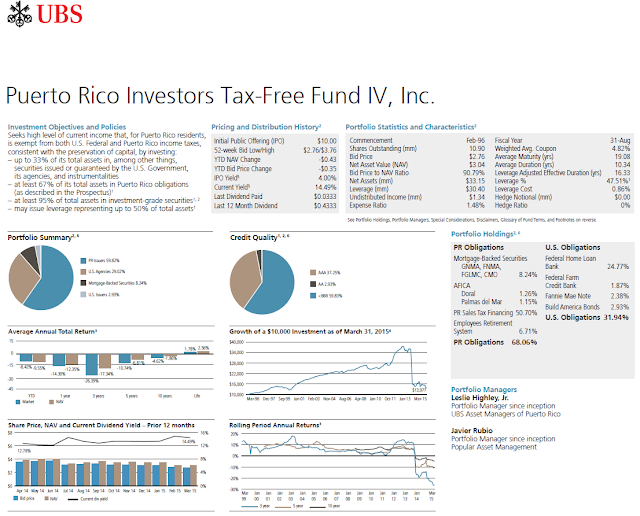 The “Pricing and Distribution History”, “Portfolio Statistics and Characteristics” and “Portfolio Holdings” sections are updated at the end of the 1st quarter 2015 but the “Portfolio Summary”, “Credit Quality”, “Average Annual Total Return” and “Growth of a $10,000 investment as of …” are not updated. That is, the 1st quarter 2015 data in these sections of the Quarterly Review are December 31, 2014 values, not March 31, 2015 values. The problem is with UBS Asset Managers of Puerto Rico since only the 14 funds solely managed by UBS Asset Managers of Puerto Rico listed in Figure 1 have these incorrect Quarterly Reviews. Compare the data in the Quarterly Reviews for the UBS Puerto Rico Investors Tax Free Fund IV - one of the nine funds co-managed by Popular listed in Figure 2 - for the 1st quarter 2015 in Figure 5a with the data for the 4th quarter 2014 in Figure 5b. For this Popular fund, the 1st quarter 2015 data in all sections of the review are March 31, 2015 values not December 31, 2014 values.